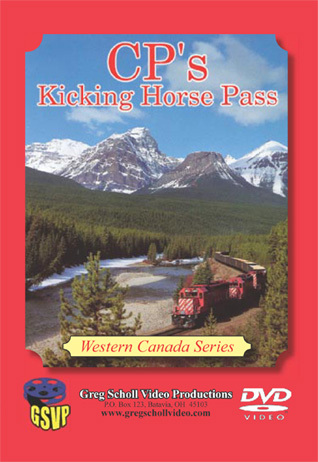 A fine volume in the Western Canada Series. This is one of four Western Canadian Titles. 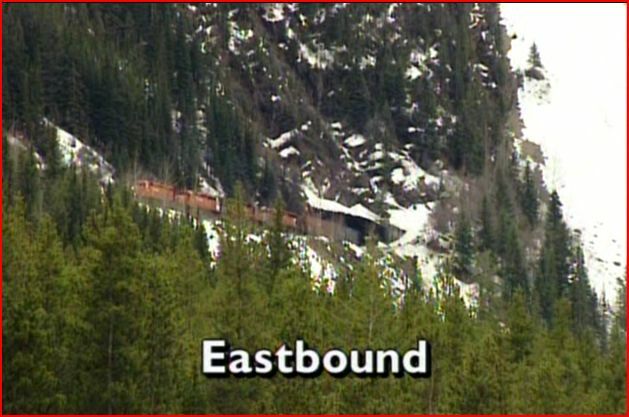 Canadian Pacific Railway on and near Kicking Horse Pass. This Rocky Mountain scenery is wonderful! Yes, the spiral tunnels are included, and there is so much more to be relished. We will need a few maps to orientate the area. They are present and referenced enough to keep our location and sense of direction on target. The videography is of a high standard. Live audio is heard in stereo sound. A multitude of viewpoints, gives excellent coverage of the extremely scenic setting. Narration is smoothly delivered, as usual by John Edwards Hingsbergen. He discusses historical background, and the current happenings on the scenes. Aural space is left to sit back and hear the trains. Chanting diesel motors upgrade and whining dynamic brakes downhill are a winning combination. An occasional airhorn reverberates in the canyon. Locomotives are predominately Electromotive SD40-2 units. They are usually in the simplified pac man scheme. A few in a newer paint job without the familiar logo. Also some older locos with the full height black and white stripes on the rear. 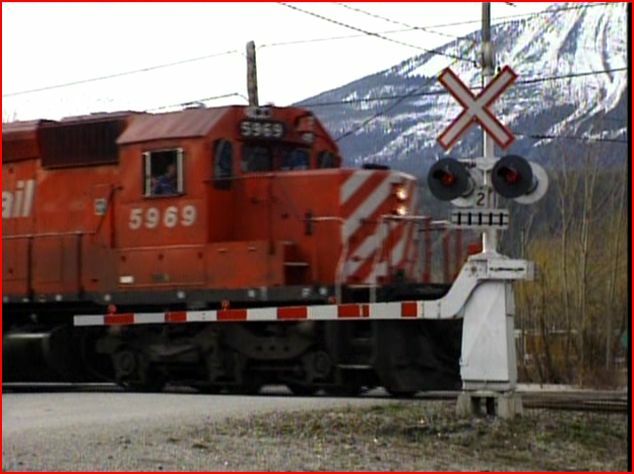 Some additional diesels such as: Soo Line, Algoma Central, and more leased SD40 units. Action packed show! The route travels Kicking Horse Canyon from Golden to Field. Further on, Kicking Horse Pass from Field to Lake Louise. This is a memorable trip, in a gorgeous mountain area! 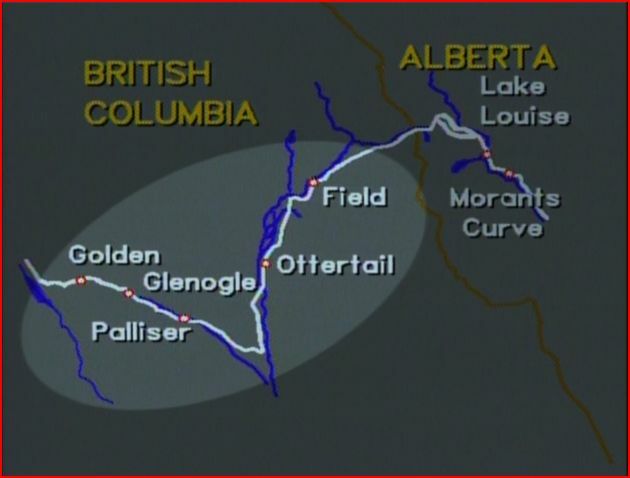 Golden, British Columbia is the first town along this route. The Mountain subdivision is from Golden to Field. 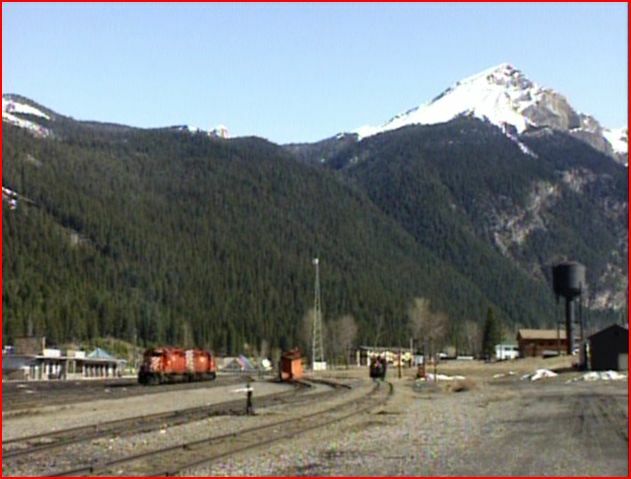 This is part of the Canadian Pacific transcontinental mainline. Golden is west of Calgary. Heading from Golden, the camera travels eastward, towards Field, BC. Holt’s Tunnel is the first of the many awesome scenes. Shot from higher elevation, the trains look like model trains, as they are dwarfed by the huge mountains. The right if way, runs along the Kicking Horse River. Nice panoramic views. The tall pine forest is all over the area. Snow capped mountain peaks that will take your breath away. Spectacular scenery. At Field, we find a modest yard and learn that this is a crew change point. This is the start of the run up to the mountain pass. Field is at 4040 feet and is a wondrous piece of railroad scene itself. An upward climb shows trains at a snowshed and another tunnel. Snow cover is included, as well as a cool tunnel view. 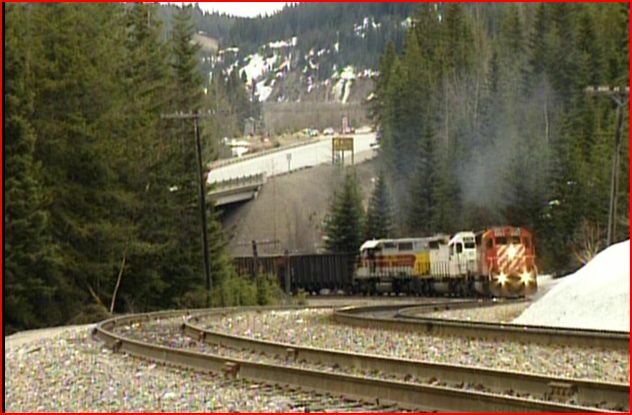 Our railfanning continues at the lower spiral of Kicking Horse Pass.This is deep within the heavy pine forest. The train is there, just don’t expect Tehachapi Loop type viewing. The spiral tunnels are a very unique feature. 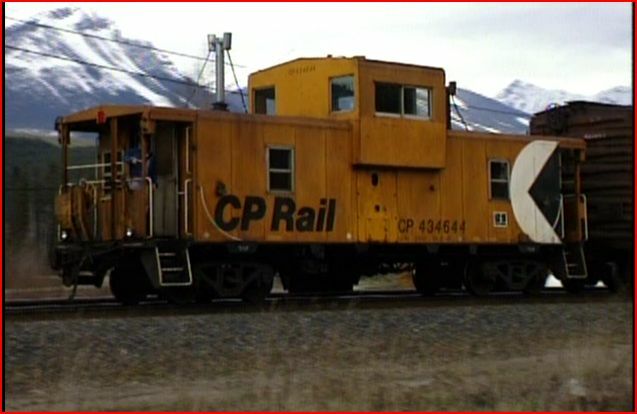 CP Rail mid train helpers, with radio control are found here. The trains can be seen, looping over themselves. 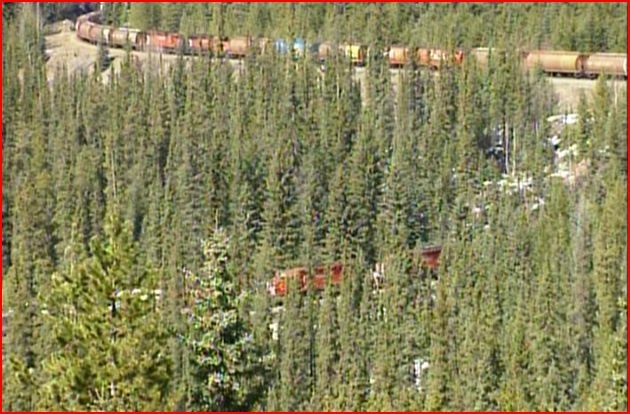 Yoho is a transitional scene as the train travels ever upwards, towards the upper spiral. This tunnel is within Cathedral Mountain. The mountain is unbelievable. You will find the origin of the name, Kicking Horse, within the program. Action at the Upper Spiral on Kicking Horse Pass. 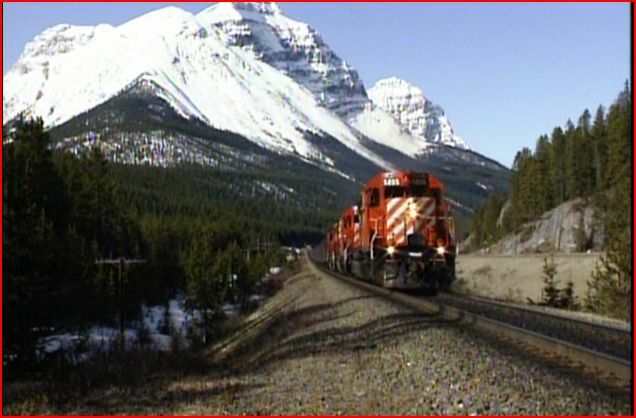 Arrival of a train at Lake Louise, Alberta signifies the ending of this program. Some views of the local wildlife briefly make appearances. Our journey ends at a point past Lake Louise station. 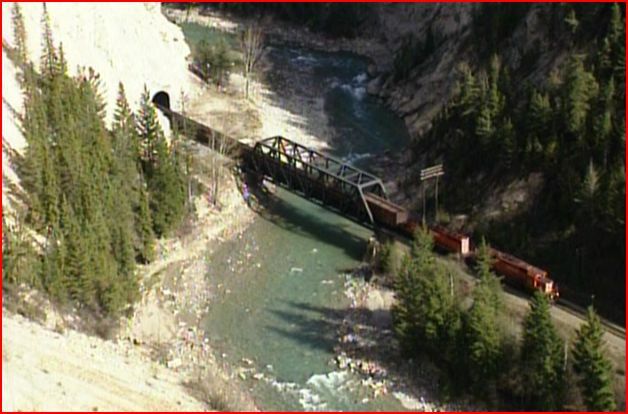 A scenic s-curve track along the river, Morant’s Curve, Alberta. This splendid show passes by all too quickly. At 45 minutes it’s a bit short. However, it is all quality time. There is a cornucopia of fantastic scenic beauty. Multiple viewings will be a bonus. You’ll need the extra plays to take all of this in. Interesting to see the variations on a Canadian crossing gate. An excellent companion with CN’s Yellowhead Pass. The programs fit together, like a pair of gloves. 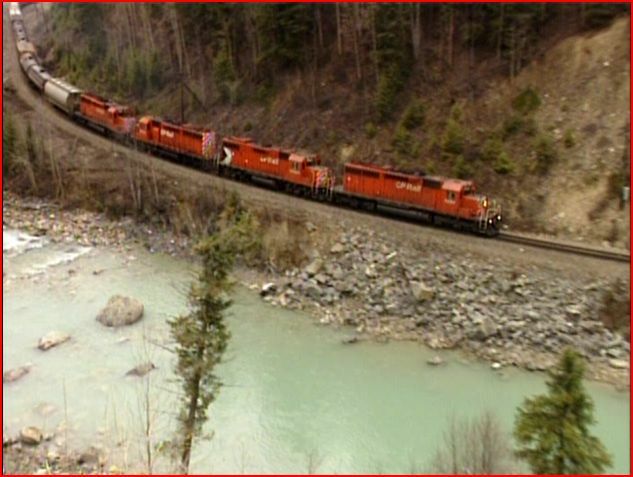 They are similar to satisfy the viewing of Canadian trains in the Canadian Rockies. Yet, they are different enough to have both shows in your collection. 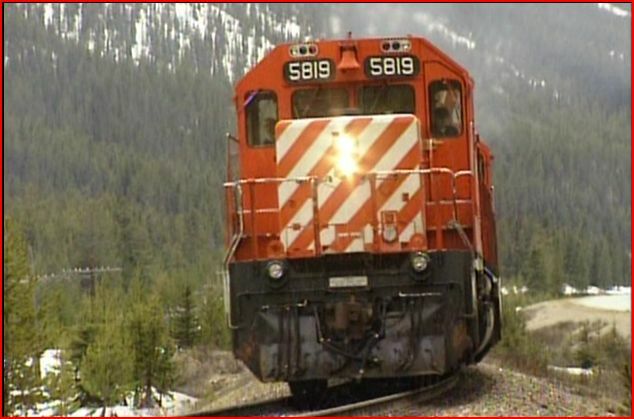 This entry was posted in ATVR Reviews, Greg Scholl and tagged American Train Video Reviews, Canada, Canadian Pacific, Railroad, Train DVD, transportation by William J. Hudson. Bookmark the permalink.